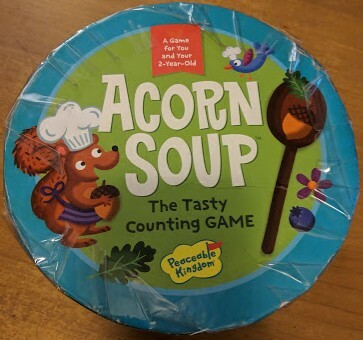 Acorn Soup is a learning/activity game for you and your two year old from Peaceable Kingdom. 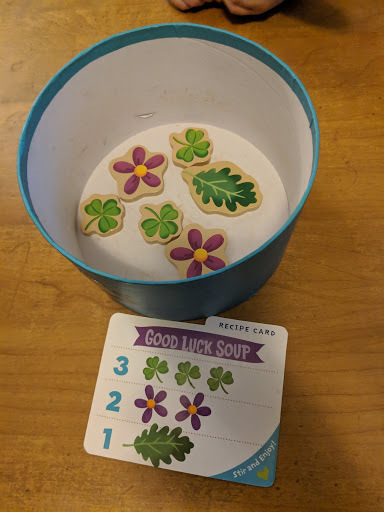 To play the game dump out the various ‘soup ingredients onto the table, draw a recipe card and have fun. Have your child find each of the needed ingredients and place them onto the spoon and then into the pot. After a quick (or long if you prefer) stir the soup is ‘ready’. Dump the ingredient back onto the table and pick another recipe card. Once you’ve completed 3 recipes the game is ‘over’. 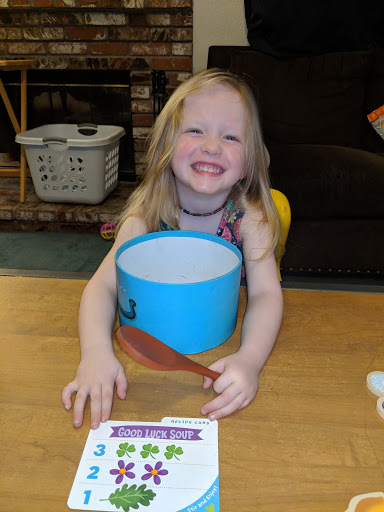 This game helps lay the groundwork for learning skills that are helpful for developing gamers to learn such as counting, shape recognition, taking turns, creative thinking, matching, and just play. Yes these things are also great skills for any child to learn but this a gaming blog. 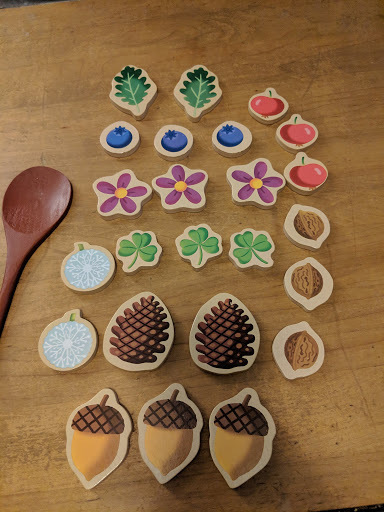 For an added bonus once you’ve made all the recipes in the game you can work with your child to make up new recipes for the game and play with those. In all this game has been a huge hit in our house with all of the kids so far. We’ve played through it many times and keep going back to it. It is a wonderful addition to any child’s collection. I love this game! I like making the soup and stirring it and playing with it. I make everyone eat the soup. My favorite recipe is Fruit Soup because I love it. I like the nut soup because its sour. 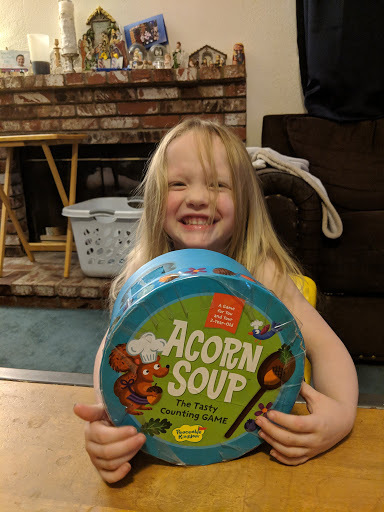 ACORN SOUP!!! Garden Soup? I like the everything soup it tastes better you need everything. Then you put the spoon in and stir and put it away. BYE BYE!